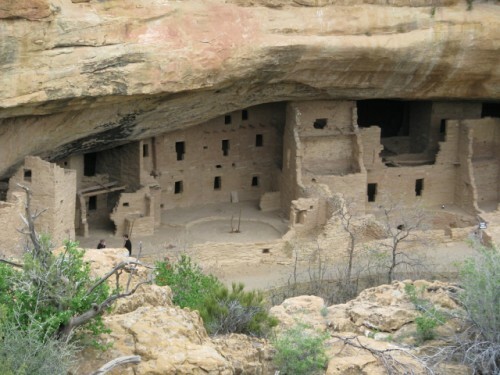 The last cliff dwelling that we visited on our trip to Mesa Verde National Park was Spruce Tree House. 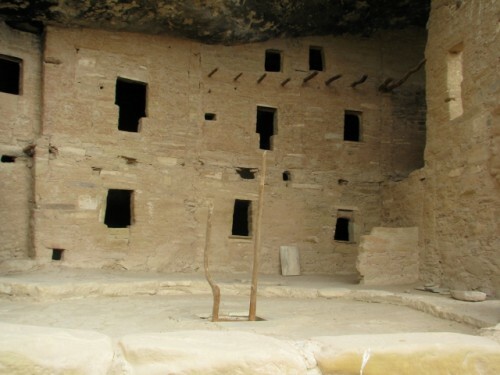 Spruce Tree House is the third largest cliff dwelling at Mesa Verde, with 130 rooms and 8 kivas. It was rediscovered in 1888, and is one of the best preserved sites at the park; about 95% original. The alcove that the dwelling is located in is 216 feet long by 89 feet deep. The dwelling was constructed between 1211 A.D. and 1278 A.D. 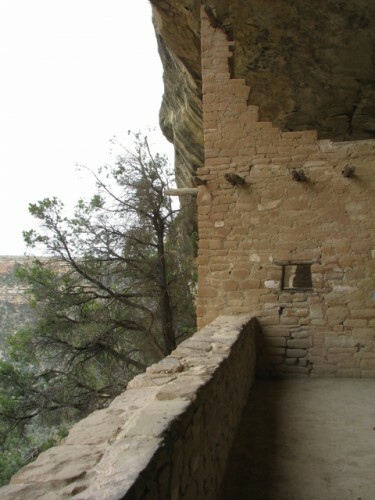 Spruce Tree House is also the most accessible cliff dwelling; visitors can visit without being on a ranger guided tour. 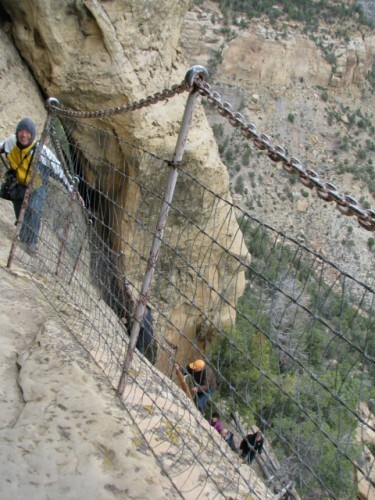 To get there, we walked down into the canyon via a 1/4 mile paved pathway. There are Rangers stationed at the dwelling to answer questions (and probably to make sure people don’t try to steal artifacts or vandalize the site), but you can explore a lot of the dwelling on your own. 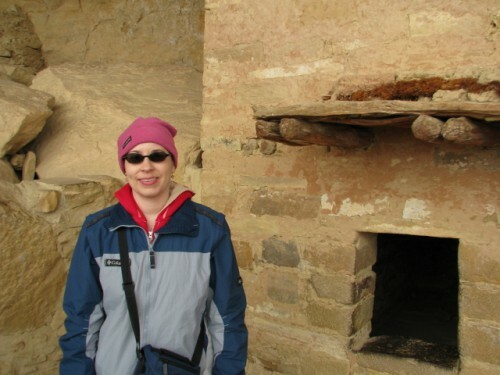 Spruce Tree House is also the only site at Mesa Verde where you can enter a kiva. The Park Service replaced the roofs on two of the kivas here, and one of them is open to visitors. Even though what we know about kivas and their use is just an educated guess, it is fun to imagine what it would have been like to witness a spiritual ceremony or meeting in the kiva. Spruce Tree House also has several T-shaped doorways; archaeologists aren’t sure if these have a spiritual significance, are merely a design element, or if they are for better temperature control in the rooms. T-shaped doorways are found throughout the Puebloan community, including Mesa Verde, Chaco Canyon and other sites – it is known that these communities traded with each other, so ideas and preferences were undoubtedly passed from one to another as well. As we were walking down to the site, we passed the trail head for the Petroglyph Trail, a trail that leads a couple of miles off into the canyon to a petroglyph site. Had the day been warmer, we certainly would have ventured out to check it out. However, on the day we visited it was very cold – probably high thirties, and although we had sweatshirts and hats, we only had summer jackets, and Jon didn’t have any gloves. It actually started to snow as we were leaving for the day. So the Petroglyph Trail goes on the list of things to do on our return trip to Mesa Verde, whenever that happens to be. If you do decide to do the Petroglyph Trail hike, be sure to check in at the Chapin Mesa Archaeological Museum, as it is considered a backcountry hike, and one tourist disappeared from the trail in June 2013. To date, no trace of him has been found, despite an extensive search. It is a stark reminder of the fact that our National Parks are still very wild. After we checked out Cliff Palace, we headed over to Balcony House to meet the rangers for the tour. The rangers at the Visitor’s Center had let us know that we would need to be climbing ladders, crawling through tight spaces, and climbing up on the original foot holds of the original inhabitants, so understandably, the tour begins with the safety talk. They give more warnings and encourage anybody who has concerns about their abilities to reconsider whether this tour is a good idea. It is a necessary beginning, because they certainly don’t want to have to deal with someone who can’t make the climb, or becomes paralyzed by fear, or gets stuck in the tight space in the tunnel. Ranger Wendell did have a bit of humor for us though, telling us that one of her fellow rangers shoots for a 90% return rate on tour participants. That’s 90% returning home from the tour; not 90% who return to the park for another tour! Ranger Clyde led our tour of Balcony House; he wasn’t wearing his uniform that day but I’m not sure why. But, as it turns out, we were in for a real treat. Ranger Clyde is a Navajo historian in addition to being a Park Ranger, so he provided a unique perspective on the sacred nature of the dwelling. We walked down the steps to get below the mesa top, and Ranger Clyde began the tour talking about the things in nature that the Native Americans used to make their world easier. The plants that they used to make clothing, shoes and bedding, the animals that they ate and used for household purposes, and the ways that they navigated their environment to survive. He encouraged us to look around at the landscape and see what plants and animals could be used, and what their purpose would be. Ranger Clyde showed us a seep, where the water would flow down through the sandstone and emerge in a little pool near the entrance of the dwelling. This water gave the Puebloans one of the key elements of survival. Even though Mesa Verde gets only about 10 inches of rain per year, there are numerous seeps that provide water year round. Then we started up the ladder. This ladder didn’t exist during the period when the Puebloans inhabited the dwelling – when we climbed up the 35 foot ladder we weren’t climbing up to the original entrance of the dwelling either. The ladder was a very sturdy double ladder, installed by the Park Service in the 1930s, and even though it was quite tall, I was perfectly comfortable climbing up. There was just a very brief period where I got a little bit nervous about the height as I was getting off at the top. Once you are at the top of the ladder, you are in the cliff alcove where Balcony House is built. 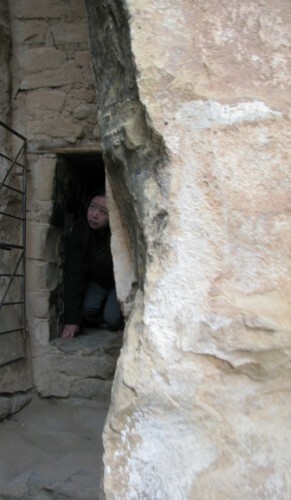 To get into the dwelling, you have to squeeze through a tight space between the back of the overhang in the cliff and the stone wall constructed by the Puebloans. This tight squeeze turned out to be fairly large when you consider what comes later. At this point we were in the dwelling, which is 40 rooms. 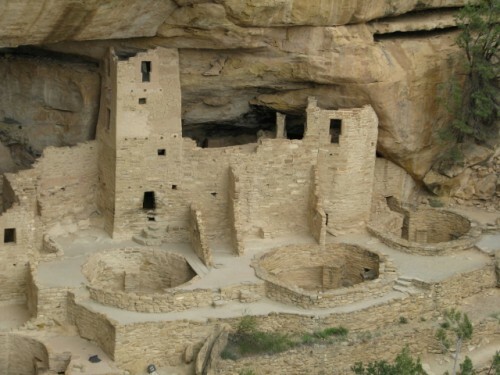 Balcony House is considered a medium sized cliff dwelling in terms of the size of dwellings at Mesa Verde. 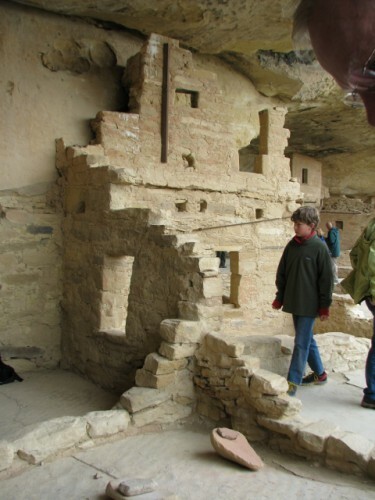 Only 10 cliff dwelling sites at Mesa Verde have more rooms. The alcove itself is 264 feet long, 20 feet high and 39 feet deep, so they made good use of the space. Balcony House is some of the last construction at Mesa Verde; it was built between 1180 and 1270 A.D. 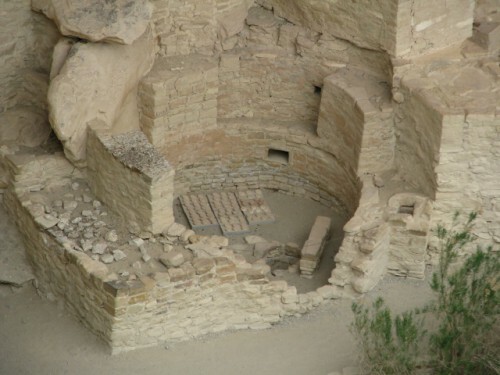 The dwelling is also one of the least accessible sites at Mesa Verde. The only access for the Puebloan people was down the steep mesa cliff, with hand and foot holds carved or worn into the sandstone over time. Although very little is known about the inhabitants here, archaeologists have made some educated guesses about why Balcony House was constructed somewhat differently than most other cliff dwellings in the area. It is believed that relationships between the communities in the Four Corners region may have deteriorated to the point where security in the dwelling was a concern. They believe that may be why Balcony House was built with such a secure entrance. When you are inside Balcony House, it is easy to see that the Puebloans used all available space. They built walls back into the overhang, and all the way up to the ceiling. There is evidence that the dwelling was 3 stories tall in some areas. You can see where the mortar still clings to the back and sides of the cliff overhang, and also where soot from fires stained the overhang black over a hundred years. More of Balcony House – in this photo you can see one of the steel support bars (to the left of the two small windows on the second story) that was installed during the restoration in 1910. It is not considered good historic preservation now, but the Park Service has let the old structural supports stay. Balcony House is named for the balconies that exist between the first and second stories of the rooms. These overhangs were used by the inhabitants to move from one second floor room to another. They may have also been used as work spaces. The fact that these balconies still exist with their original 800 year old wooden beams and adobe mortar is amazing. In some rooms, wooden beams up high near the ceiling are thought to be drying racks. Me inside Balcony House – you can see the one of the balconies that the dwelling is named for. And please pay no attention to my mismatched outfit – it was cold that day and I had to wear all of my warm clothes! After we finished up our tour, there is still the process of getting out. The original entrance to Balcony House is what the Park Service uses as an exit – a 12 foot long roofed tunnel built by the original inhabitants. Short people like me can duck walk through the tunnel, but taller people have to crawl to get through it. Either way, it is a tight squeeze – they recommend taking off your backpack to get through if you are wearing one. The original entrance tunnel to Balcony House – could you fit? 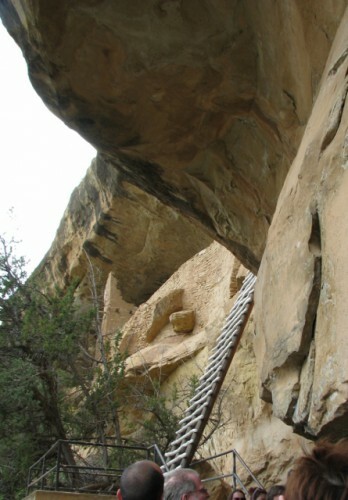 Once we were outside of Balcony House, we made our way back up to the mesa top using the hand and foot holds that the Puebloan people used when they lived here. The Park Service has enlarged them and installed a fence that will keep most people from falling (unless you tumble over the fence), but the journey up the cliff was still a bit scary for me. Let’s just say I did not look down! The climb back up to the mesa top from Balcony House. There are no statistics on how many of the Puebloan people died in falls. I loved our tour! It was fascinating to see just how tough these people were and to experience just a tiny bit of how they would have lived. It was well worth challenging my fear of heights yet again! Have you toured Balcony House? Are you brave enough to want to? Today is our fourth anniversary. 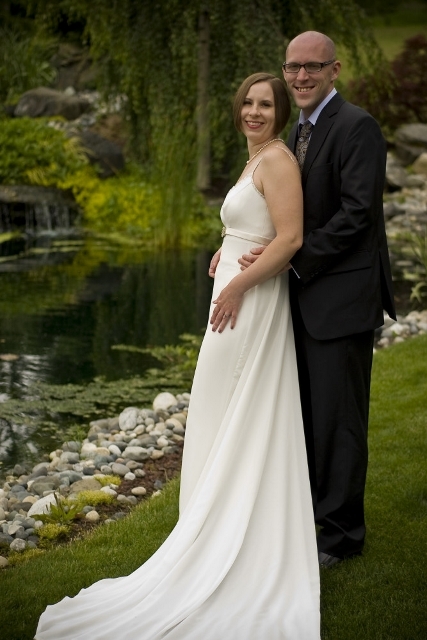 On that day, four years ago, I married my best friend, my partner in travel, the one who helps me keep my sanity when things are stressful at work. Even though four years seems like a tiny little blip in time (especially when considering geology in the National Parks), we have done a lot and been through a lot in that time. And we drank a lot of wine! 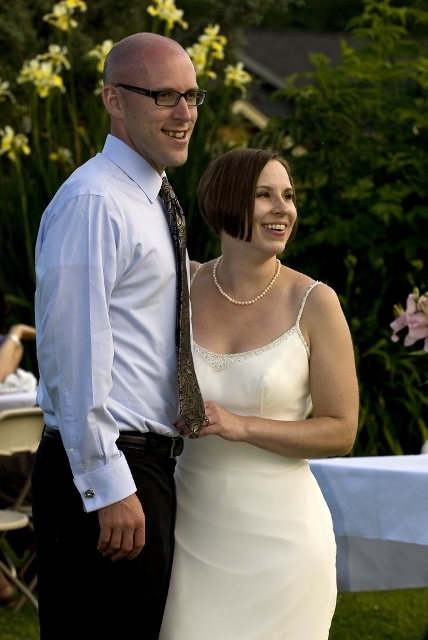 Happy Anniversary to the one who makes me a better me. Our first stop at Mesa Verde National Park was at the Visitor’s Center – I got my National Parks Passport stamp, some postcards, and some handy booklets with facts on the various cliff dwellings. We talked to the ranger about our options for a tour, and I decided to book us for the Balcony House tour. I would have loved to do the tour of Cliff Palace too, but I didn’t think I could get Jon to do two tours in one day. I chose Balcony House because it was the most challenging tour, with the ranger explaining that visitors would have to climb a ladder, crawl on their hands and knees and scale the side of a cliff. Oh, that’s all… And they also said it wasn’t a good tour for people with a fear of heights. Even though I am afraid of heights, this tour sounded a lot cooler than the others. We were in! The tours are an extra fee, not covered by your annual parks pass or the standard entrance fee, but they are still very reasonable – $4 per person. We had some time to stop at Cliff Palace on our way to Balcony House for our tour. Cliff Palace is the largest cliff dwelling at Mesa Verde, consisting of about 150-200 rooms. The dwelling was discovered by Richard Wetherill and Charlie Mason in 1888, while they were out one winter day looking for stray cattle. Wetherill was ranching in the area and had spent some time building relationships with the local Native American tribes; they told him about the dwellings in the canyons. The Ute tribe that was living in the area had known about the cliff dwellings for generations, but they considered them to be sacred land, so they didn’t inhabit the dwellings themselves. Cliff Palace is built below the mesa top into the cliff, underneath a large flat overhang under the mesa top. The Park Service has built a series of steps into the cliff so visitors can climb down into the dwelling on tours. There are also a few 10 foot ladders that you have to access to get into the site, but it doesn’t have the significant climbing and crawling that is required on the Balcony House tour. Because of the stairs, it is fairly accessible to large numbers of the public, so it is the park’s most popular tour. Cliff Palace was built between 1190 and 1260, in a period when the Puebloan culture was moving down from the mesa tops into the alcoves. They devoted a lot of time and resources to construct these elaborate homes and spiritual sites; hauling in water to mix mortar, and making plaster to smooth over the block walls. Cliff Palace was three stories tall in areas and had 23 kivas. A kiva was the spiritual center of the dwelling, and is thought to have been a center for worship and perhaps the business of the community. There is a four story square tower in the Cliff Palace complex as well. Close up of the Cliff Palace tower. The lighter areas on the tower indicate reconstructed areas. Cliff Palace would have been one of the more comfortable cliff dwellings at Mesa Verde. Its position relative to the sun would have allowed it to receive more sun during the winter to warm the dwelling, while being tucked in under the overhang protects it from the harsh winter winds. During the hot summer, it would have been protected from the sun beating down from directly overhead, making it cooler. The view of Soda Canyon from the Cliff Palace Overlook. Cliff Palace is out of frame, in the lower left. However, despite it being one of the more comfortable cliff dwelling sites, Cliff Palace is thought to have only housed about 100 people. Researchers believe that a small number of people lived there year round, and others came for special ceremonial observances during the year. This guess is based on the fact that there is a fairly low ratio of living rooms to kivas. When we were there, there was a tour of the dwelling just leaving from the mesa top. As a result, the dwelling was empty and I was able to get some great photographs of the dwelling from the viewpoint on the mesa top. That said, I would love to tour this dwelling whenever we are able to return. After we checked out Cliff Palace, it was time to head over to Balcony House for our tour. I’ll post about that next! Have you ever done the tour at Cliff Palace? What was your favorite part? It’s a good thing I’m really not all that sentimental. Because Jon lost his wedding ring. Now before you get all worked up about it, you must understand that he lost it a long time ago. I can’t even remember how long ago. Probably more than a year. But on the flipside, this was his second wedding ring. The first one was lost for the first time at our wedding reception (I kid you not) and he lost the first ring for good a few weeks later. 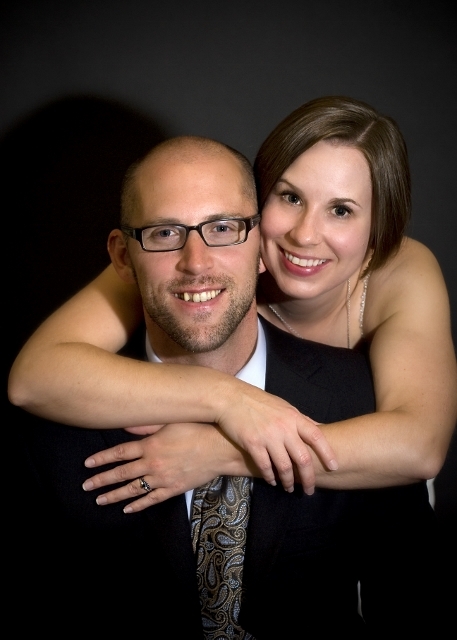 We have not even been married for four years yet! But anyway, back to the second ring. I have been pondering getting him a new (third) ring, certainly something cheap, but I hadn’t gotten around to it. Clearly I have some issues with procrastination. And out fell, from the chair he always sits in to watch TV, Jon’s ring. Just in time for our upcoming anniversary. We got to visit to Mesa Verde National Park! Mesa Verde means green table in Spanish, named for the flat topped mesa that is covered in piñon pine (also spelled pinyon, but I prefer the Spanish spelling) trees. 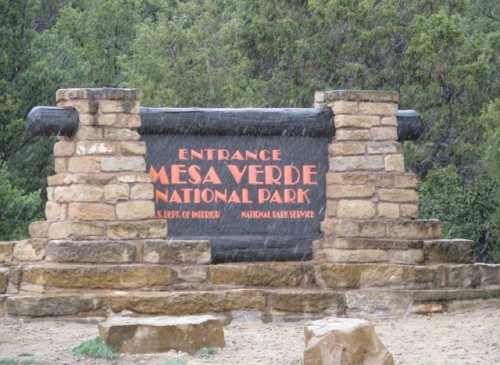 Mesa Verde National Park was created on June 29, 1906, by President Theodore Roosevelt. The current boundaries of the park encompass 81.4 square miles, or around 52,000 acres. Almost 600,000 people visit the park each year. The land was once a giant ocean, and the canyons that exist today were created when the ocean and waterways receded, and erosion worked its magic on the sedimentary layers. Elevations in the park range from a low of 6,000 feet to a high of 8,572 feet. 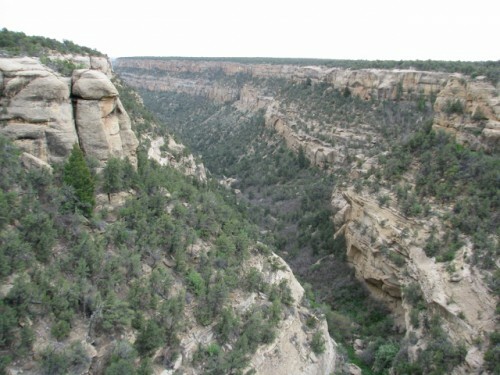 Mesa Verde is the only National Park in the country that was created to protect a cultural site, and it is also a Unesco World Heritage Site – designated in 1978. 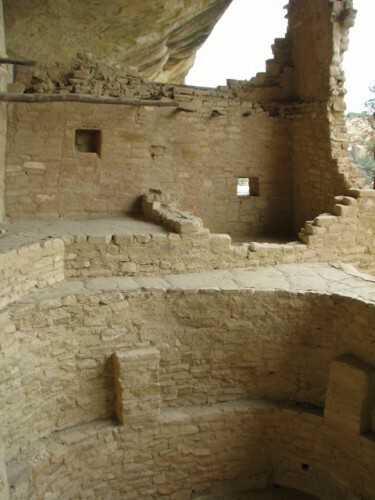 Mesa Verde protects over 4,700 archaeological sites created by the Puebloan culture, including dwelling sites, spiritual sites, ancient roads and other sites. 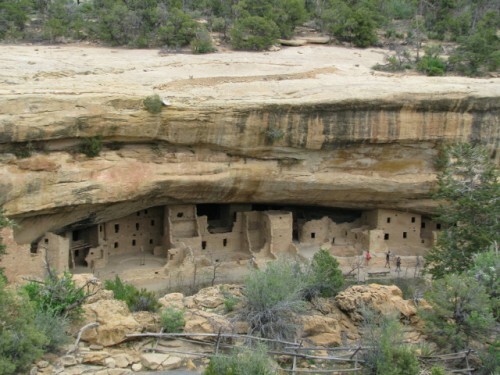 Over 600 of the structures in Mesa Verde are cliff dwellings – these are the sites that the park is most famous for. The first culture to live and farm at Mesa Verde were known as the Basketmakers. 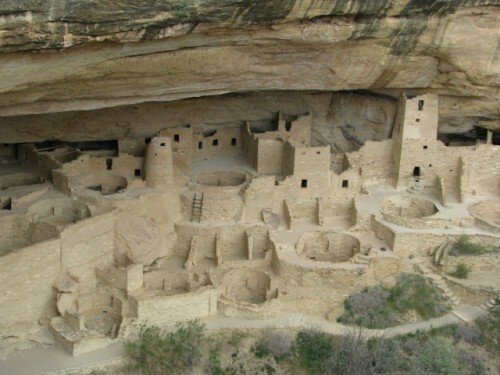 Sources vary on the date, but it seems that they began living in Mesa Verde beginning about 400 A.D. They made very detailed and beautifully woven baskets, which they used for many utilitarian purposes, including storage, cooking, and carrying water. They lined some baskets with pitch in order to waterproof them for carrying water. Around 550 A.D. the Puebloan people were living on the mesa tops, growing maize and hunting to supplement their diet. They also domesticated turkeys and dogs. This culture discovered pottery methods, and they turned their attention to making pottery and fewer baskets. During this period on the mesa tops, they started out living in pit houses, which were houses dug into the ground of the mesa, with a roof made from timbers laid in rows and covered with reeds, brush and earth. In about 750 A.D., they began to build villages on the mesa tops from adobe. Initially, the walls were fashioned with a simple mud and pole construction, but over time their methods improved, and they began constructing buildings using stone masonry with adobe mortar. At this time, they were still living on the mesa tops. 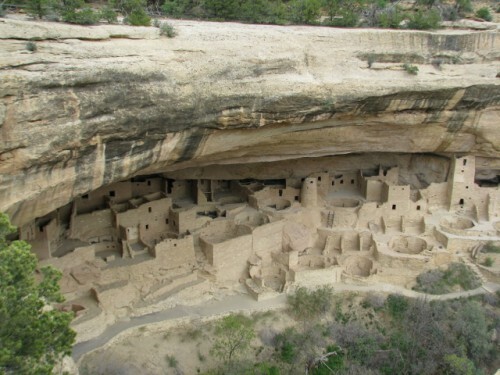 What most people don’t know is that the Puebloan people only began to build the cliff dwellings that Mesa Verde is famous for in the 1190s. And the Puebloan people are thought to have left the area around 1300 due to a prolonged drought – that means they lived in the cliff dwellings for only slightly more than 100 years. Of course, that explains why only 600 of the 4,700 archaeological sites are cliff dwellings. Between around 1300 and the 1800s, the Ute tribe came to the area. Spanish explorers traveled through the area in 1776, looking for a route from Santa Fe to California. They described the mesa and the canyons during their expedition, but apparently did not get close enough to see the cliff dwellings tucked into the alcoves. In the 1870s, the area was home to the Ute tribe, and trappers and prospectors moved through the area. The Utes had long known about the cliff dwellings, but considered them to be sacred sites and did not live in them. One prospector, John Moss, found a cliff dwelling in 1873 and described it for the greater population. In 1876, a federally financed survey crew came through; that led to the first discussion of a systematic study of ruins in the American Southwest. Meanwhile, the Wetherill family were living and ranching in the area, and had befriended the local Utes, who told them about the cliff dwellings tucked into the alcove. After gaining permission to winter their cattle in the canyons, Richard Wetherill spotted Cliff Palace and climbed up to it. He and his family and friends explored Cliff Palace and collected many of its artifacts. Some he sold to the Historical Society of Colorado, and many he kept for himself. 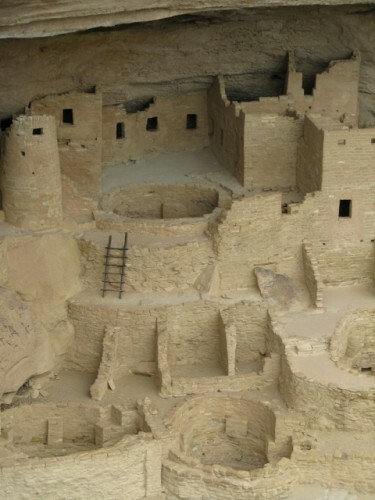 The Mesa Verde dwellings were no longer a secret. In 1891, the Wetherills hosted Gustaf Nordenskiöld, a Swedish explorer and mineralogist. He introduced scientific methods of collection and cataloguing of artifacts, and meticulously documented and photographed all of the artifacts he found. Unfortunately, he also packed up a large number of them and shipped them to Sweden. The collection then was acquired by the National Museum of Finland, where it still resides today. It’s really sad. This was a major catalyst in the dialogue for protecting the site in the future. Fortunately, the movement to preserve Mesa Verde had a lot of interest, and was ultimately successful. I’ll post about our visit to the park next! My weeks have been tough lately. Working long hours, on tough stuff. I’m wiped out and it’s only Wednesday! Jon opened up a 2011 Panther Creek Pinot Noir Winemaker’s Cuvée last night. I was still finishing off a bottle of Chehalem Riesling (delicious! ), so I didn’t have a glass of the Pinot until tonight. I poured myself a glass to pair with a quick dinner of Gardenburger and edamame, and settled in to relax. On the nose, this wine has that characteristic Pinot pickle aroma, as well as an earthy aroma. On the palate, this wine is bold; earthy with lots of tobacco and spice on top of overripe cherries. I love it. It is delicious, making me wonder if it was even better last night! This wine is definitely turning my evening around. I couldn’t really find any information on this wine online, so I suppose you’ll have to take my word for it that it is great. Panther Creek is located in McMinnville, Oregon, and they just opened a new tasting room in Dundee, Oregon too. Have you had Panther Creek wines? What are you drinking tonight?